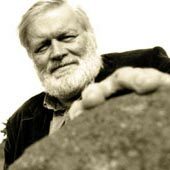 In an interview with Culture Northern Ireland, our poet Michael Longley stated that his favorite types of music were “Boogie-woogie and Bach.” Longley claims that he has been guided by the musical muse since he first began writing in his teenage years. According to an article Longley wrote for The Guardian in 2011, the muse has often arrived in the form of jazz musicians, particularly the pianist Fats Waller. Longley first heard Waller’s song Alligator Crawl on the radio in 1955. He recalls being “transfixed” by the song, though the feeling was fleeting. In his teen years, Longley’s devotion was not to Fats Waller, but to classical artists such as Bach, Chopin, and Tchaikovsky. Though his interest in jazz began to perk up again during his college years, it didn’t morph into passion until his first year of marriage. While living in Belfast with his wife Edna, Longley purchased Fats on the Air, two LP recordings of Waller’s radio broadcasts. Longley felt the same awe and marvel that he had felt for Waller as a child. But this time, the muse stuck around. In The Guardian, the poet said, “I adore the drive, the warmth, the apparent spontaneity, the dizzy humour, the hilarious demolition of sentimental material.” For his book No Continuing City in 1969, Longley wrote a short collection of poems on jazz called “Words for Jazz Perhaps.” The first of these, titled “Elegy for Fats Waller” portrays Longley’s hero as larger than life. The other three poems in the jazz collection are for Billie Holiday, Bud Freeman, and Bessie Smith.